A basic two-car garage door can weigh 200 to 400 pounds, depending on the materials of construction, yet most people can open one with just one hand. How can this be? You may appear to have the strength of the Six Million-Dollar Man, but the real answer lies in springs, pulleys and rollers. Keeping this complex mechanical system in good repair will ensure that simple, weak humans like us can operate it easily. Here's what you need to know to maintain your roller garage doors. Most of the weight of roller garage doors is taken on by the springs; the rollers keep things in-line and reduce some of the frictional loads that remain. Dirty tracks, worn rollers and sticky bearings can increase these frictional loads to a point where the system begins to break down. As part of your maintenance plan, these items need to be inspected regularly. The track that the garage door rollers ride in needs to be free of debris and aligned properly. Small bits of dirt can prevent garage door rollers from rolling smoothly: Just as a small pebble in the parking lot can bring a shopping cart to a near standstill, obstructions here can add load to your opener, or your arms. 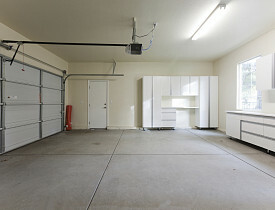 Some garage door rollers are designed to operate without any lubrication in the track; others may require a "dry lube." Do not use any oil-based products or grease in the track, as these will attract dust and dirt and lead to more trouble. Loose mounting bolts in the track can also result in alignment problems, so these should be checked regularly too. Garage door rollers fall into two basic groups: those with metal wheels and those with nylon wheels. Within these groups there are a number of different quality grades. With simple inexpensive garage door rollers, the wheel spins on a basic axle. Higher quality garage door rollers have ball bearings, and top-of-the-line garage door rollers have maintenance-free sealed bearings. In all but the highest grade, these bearing or axle locations will need periodic lubrication. When lubricating these locations, take care to not get oil in the track. One simple way to improve the operation of your garage door is with a roller replacement. If your garage door rollers are worn or of inferior quality, replacement is often a great choice. Garage door rollers come in many configurations. To make the replacement as seamless as possible, be sure you match wheel size, shaft length and shaft diameter. Positioning each garage door roller at the access point in the track will allow you to replace them individually, without a complete tear down of the garage door, saving a lot of work and possible headaches. Whether your garage door is brand new or not, a few hours of work now and then can keep it in great shape and provide years of trusty service. Proper lubrication of the garage door rollers, if needed, is a simple and quick task that can prolong the life and ease the strain on you or your opener. The ease of lifting hundreds of pounds of door depends more on mechanics than Six Million Dollar strength. Keep up on garage door maintenance and adjustments for your ease and safety. If you don't have the time or confidence to DIY, hire a reliable garage door professional.